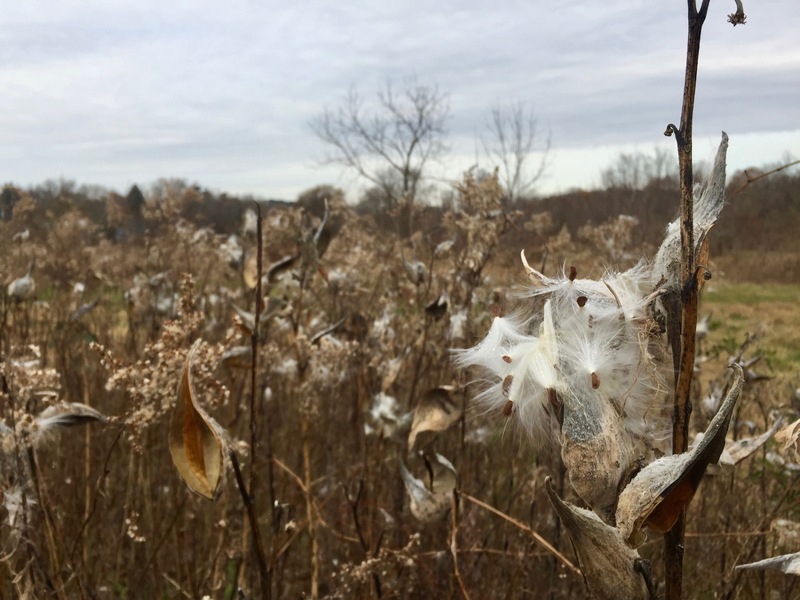 Nayfield Preserve – Welcoming spring! Nayfield Preserve is located on Lambertville Hopewell Rd in Hopewell. Link to trail map. I was recently contacted by a researcher interested in studying Viburnum species and their pollinators and I jumped at the chance to show him around Nayfield. This preserve can be tricky to find, but once you arrive, it is such a wonderful place to walk. The big open field, the drier upland area, the wet lowland area, vernal pools and evergreen forest…I mean, what is there not to love? When I hike with others, I always learn something new. Today was no exception! For a while now, I have puzzled over a certain shrub which, in some ways, resembles a Cherry tree (Prunus). Cherry trees have alternate branching patterns but this shrub had branches that were opposite each other. Although I know that there are only a handful of trees which have branches directly opposite each other, nothing in my mental plant catalog could help me identify what I was seeing. This entry was posted in Uncategorized on March 29, 2019 by Carolyn. Rockhopper Trail – Looking for signs of spring during a very mushy snow hike! Rockhopper Trail is located on Brunswick Ave in West Amwell. March is a wonderful time of year because of the anticipation of spring! It is cold and wet and yet the plants are starting to wake up and slowly letting the world know it will soon be spring. I always loved going on scavenger hunts as a child, and now looking for signs of spring is my scavenger hunt. I had planned to spend my morning looking under leaf litter for cotyledons and opening buds but the weather had other plans. We had a heavy wet snow, so I decided to bring the whole family and just enjoy the beauty of a snow laden forest. I did, of course, keep my eyes peeled for opening buds, but there is so much wonder and joy of being the first to walk on the snow that it was just a wonderful morning exploring the forest. Walking, riding and skipping…Into the Woods we go! Shagbark Hickory, Carya ovata, bud just beginning to open! It will be some time before there are any flowers, but the process of a new spring has begun! It was cold enough to snow but not quite cold enough to freeze so the ground was a mushy, slushy mess and perfect for splashing Good thing the Wild Boys came prepared in their wellies…Unfortunately, my husband and I only had on our hiking boots which kept us mostly dry, but we had to be more cautious about where we stepped. We all explore at our own pace and in our own way. Littlest carefully assessing his steps because the ground was very slippery! I know I have said it many times, but I love the Sourland Conservancy high-visibility orange hats! My big dude took off running through the woods, but I could always see where he was because of his hat. Multiflora Rose, Rosa multiflora buds are becoming red and are beginning to open. American Beech, Fagus grandiflora. These sharp, pointed cigar-like buds are a great way to distinguish this tree in the winter! Our boots made loud suctioning sounds as our feet sunk down and lifted the wet snow and mud. I love how this branch covered in lichen resembles a dog chew-bone. A quintessential Sourland boulder looking picturesque in the newly fallen snow. Slosh slosh slosh! Deer tracks! We tracked this deer for almost half of a mile along the trail. It kept going on the trail even after we turned around to go back to the car. A fairy’s eye view of the world! Who wouldn’t be smiling if they had a personal ride through a winter snow laden forest? Christmas Tree Fern, Polystichum acrostichoides, poking out through the snow. Another gorgeous boulder standing out proudly in the snow.Before you know it, this forest will be flush with green again, obscuring the view of these peaceful centennials. Spicebush, Lindera benzoin, buds swelling and getting ready to open. Spicebush is among some of the first shrubs to flower in the early spring! There were lots of rock hoppers on this trail! When I saw this tree hollow, I thought of the book “My Side of the Mountain” and the little boy, Sam, who lived in the hollow of a tree. I loved the story as a child and had always wanted to try to make acorn pancakes… Maybe this will be the year that I try it! Winged Euonymous, Euonymous alatas, an invasive that is unmistakable due to its winged stems. The other common name for this plant is “Burning Bush”, because the leaves turn a vibrant red in the fall. More fun on Sourland boulders! A winding path through the woods. We spotted a bird’s nest in a Multiflora Rose bush. The multiflora rose protects this nest from predators by concealing the nest and fending off predators with its thorns. A sneaky Lichen looking like a trail blaze! Luckily, we knew we were on the blue trail. Nice try! Seta poking up through the snow. Seta are the stalks that support the spore capsule of a moss. Spring Beauties, Claytonia virginica standing out in the snow. These lovelies were just about big enough to support flowers. I bet that in another week or two they will be flowering! A peaceful winter hike with a splash of an ending! The Rockhopper preserve shares a parking lot with Dry Creek Run preserve. When we returned to our car, I removed Littlest’s jacket so he could get in his carseat but when he saw the Dry Creek Run trail, he took off down it. He knows that when there is a trail head, it is time to explore! This entry was posted in Uncategorized on March 11, 2019 by Carolyn. Guest Post – Sourland Mountain Preserve: A winter hike on a day off. This post was written by Keana, one of our Spring 2019 interns. She is interested in ecology and photography, so I felt a blog hike would be the perfect first assignment. Enjoy! With a day off from school and a partly cloudy weather forecast, I decided to seize the opportunity to go hiking. After weeks of devoting all my “free-time” to studying for midterms in stuffy cafes and overcrowded libraries, it felt liberating to finally step outside and breathe the crisp, bone-chilling air of the winter season. Before beginning my little adventure in the Sourland Mountain preserve, I was greeted by the skull of a deer. I figure it probably belonged to one of the many white-tailed deer of the region, whose overpopulation still continues to threaten the Sourlands. A black sooty mold infesting a branch. This mold eats the “honeydew” left behind by the Beech Wolly Aphid. There was an abundance of colorful mushrooms growing on many trees and fallen trunks. Though it looks cool to me, I know the mushrooms are definitely not a good sign for the trees. I spy with my little eye five vultures. Japanese Barberry, Berberis thunbergii, is an invasive shrub found in the Sourlands. It’s bright red fruit contrasts starkly against the dull brown backdrop of the branches. Apparently the berries are edible and have a bitter taste, but I was not in the mood for trying (especially with all the dog and deer feces that were laying around). I was expecting the pond to be completely frozen, but surprisingly only the center of the lake was covered in ice. The transparency of the ice gave me a sneak peek into what lay beneath—not much except for a lot of leaves and scattered branches. Unfortunately, I did not catch a glimpse of any fish. The picturesque elevated walkway that winds through the rocky Sourlands. I remember coming here as a kid and challenging my sister to cartwheel contests along the path. This entry was posted in Uncategorized on March 7, 2019 by Carolyn.